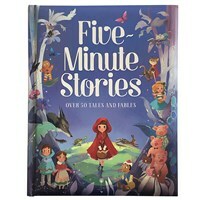 There is always time to read together with this deluxe treasure-trove of five-minute stories, fables, and well-loved fairy tales. There are over 50 easy-to-read stories to enjoy in this enchanting collection - and each one fits perfectly into the beginning, middle or end of a very busy day! This beautiful story-time treasury brings together the talents of illustrators from around the world, with well-loved tales including Aladdin, The Boy Who Cried Wolf, Cinderella, Pinocchio, Puss in Boots, Rapunzel, Sleeping Beauty, The Three Little Pigs, and many more. Collect all titles available in the Parragon padded treasury book collection. Cottage Door Press is an independent publisher of high-quality children’s books. We believe that every child deserves an excellent first book experience—beginning on the day they’re born. Reading is learning is our driving philosophy, and we strive to help parents understand why reading aloud from birth is so important. We offer a simple development-based guide to help them on their journey.